Hiking Machu Picchu Mountain? You’d better read it carefully! Planning my visit to the iconic Machu Picchu, which was just elected the best-rated landmark in the world by TripAdvisor’s Travellers’ Choice Awards 2016, I decided to spice it up a bit and add some adventure. 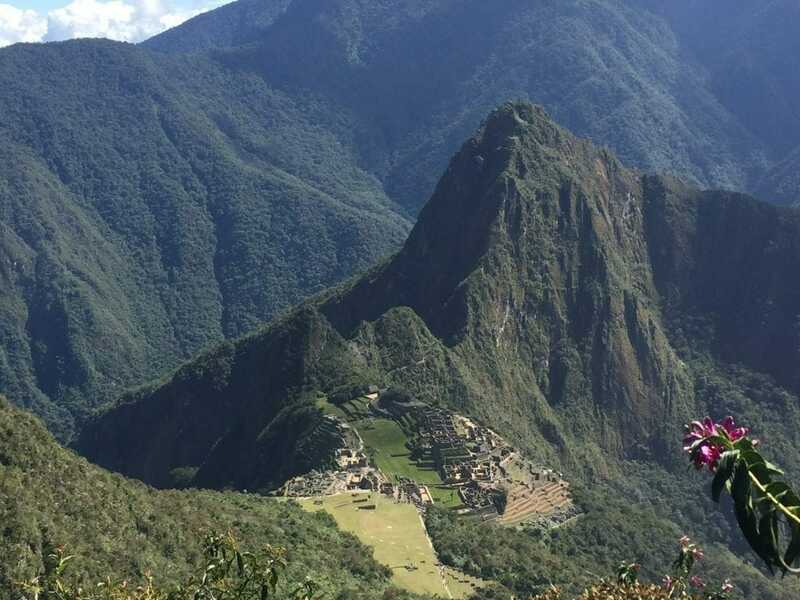 There are two mountains that you can climb when visiting Machu Picchu: Huayna Picchu (located behind the citadel and commonly seen in pictures as the background of the ruins) and Machu Picchu Mountain (on the opposite side of Huayna Picchu). I wanted to do the most famous and popular: Huayna Pichhu hike. But the problem is only 400 people are allowed to climb this mountain daily and tickets have to be purchased at least three months in advance. Therefore, I decided to do the Machu Picchu Mountain hike, but I didn’t know anything about it (elevation, time, difficulty…). As a result it was surprisingly extraordinary, but also the hardest hike I’ve ever done. Where is Machu Picchu Mountain? Machu Picchu Mountain is situated in front of the citadel, towering 3,061 m (10,042 ft) above sea level, 631 meters (2070 feet) higher than Machu Picchu, and provides unparalleled and breathtaking views of the Inca sanctuary and the mountains surrounding it. 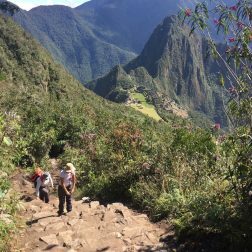 Only 400 people daily can hike Machu Picchu Mountain, divided into two different groups: from 7:00 – 8:00 AM, and 9:00 to 10:00 AM. Tickets can be purchased at the Machu Picchu entrance, but I really recommend to buy it online in advance. Important Note: Since January of 2019 visitors have to choose the time slot they want to start visiting Machu Picchu. The first is at 6:00 AM and the last entrance is at 2:00 PM. The visit now is limited to only 4 hours but for those who are hiking Machu Picchu Montaña the limit is 8h (5h for the hike and 3 for the citadel). After visiting the citadel I headed to the upper-trail and followed the path to Machu Picchu Mountain. At the entrance everyone has to present the ticket and register at the warden’s hut. There was a line but I didn’t wait too long. 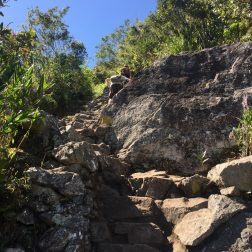 I started hiking Machu Picchu Mountain at 9:45 AM and had limited time, one hour for each way, because I still had to take the van back to Cusco in Hidroélectrica. The only problem was that this hike takes at least 3h (1h30min accent and 1h30min descent). So, I had to set my mind that I would not be able to finish it; otherwise I would miss the van. The trail is well-marked, easy to follow and made up of stones with terrain in some parts. If the trail isn’t difficult, the high altitude makes everything arduous. After 10 min hiking I was already having a hard time to breathe. The sun was shining bright and the temperature was pleasant, but just in some parts of the trail you find shade. After a few minutes hiking Machu Picchu Mountain I was drenched and feeling very hot. 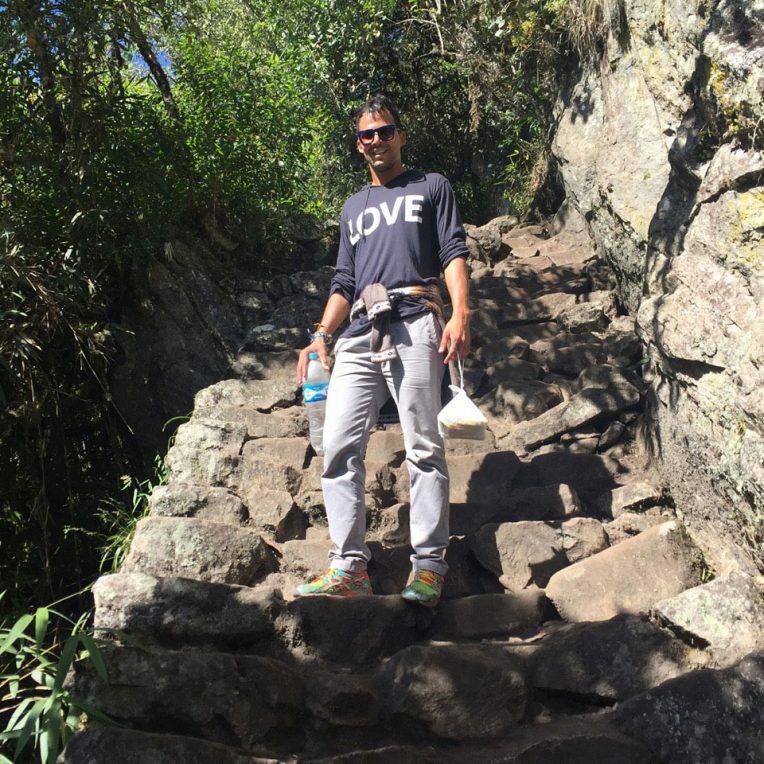 I was so unprepared to climb Machu Picchu Mountain: I wore trousers, a long sleeved shirt and a sweater. The big problem was that I woke up at 4:00 AM, hiked from Aguas Calientes to Machu Picchu (two hours in total) and walked two more hours visiting the citadel. On the top, I just had a bottle of water and my breakfast in a bag with me. I was sweating, stopping every other minute to catch my breath, asking myself why I was doing it and saying that this would not be worth it since I would not have enough time to reach the summit. I’ve never felt like this during a hike… quite the opposite, I always feel empowered and proud doing any physical challenge. But I noticed that I was not the only one feeling like that. Everyone seemed breathless, tired and was resting on some of the steps which were wide. I was so exhausted and about to quit, but the views from the trail were unique and striking that I wondered how it would be from the top. At one point I felt my blood pleasure going down and had to stop to eat something. My legs felt sluggish but my mind was hurrying me up because of the time. People resting and catch their breath. After 45 min hiking I asked people coming down how far I was to the top. The answers were so mismatched (15, 20, 30, 50 min…), nevertheless it motivated me to keep going. Although I didn’t know what to expect, the last 30min was even harder. The trail got narrower, dangerous and steeper. In some parts I couldn’t look up and fixed my eyes only on the next step. I finished one stairway, turned and finished another stairway… Hikers were cursing, stopping, supporting each other… I was in a rush running out of time. After over an hour I saw the summit and got excited. 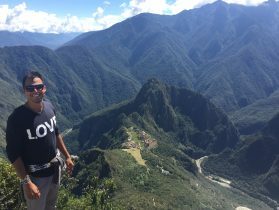 Few more ascents and I reached the top of Machu Picchu Mountain and felt exhilarated. The panoramic vista is from another world. 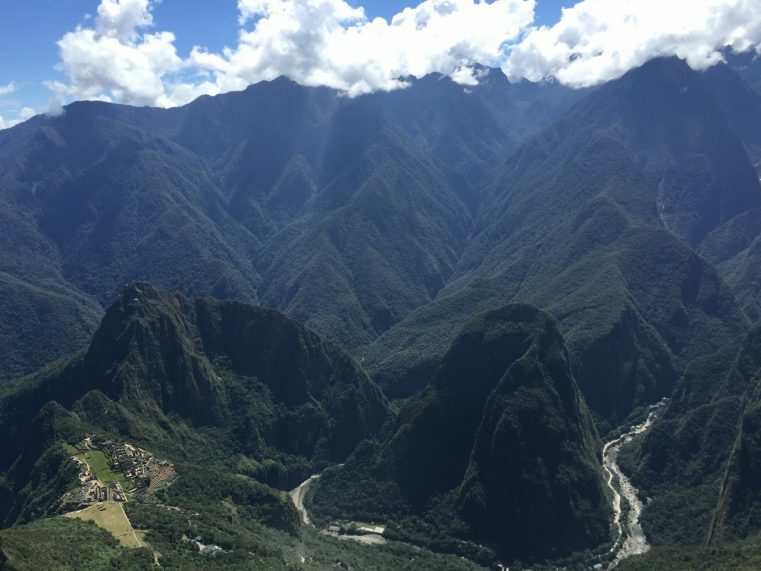 The inca ruins, Huayna Picchu and Putucusi Mountains looked so small behind the giant row of mountains that it made me wonder if it was true what I was seeing. I was astonished! 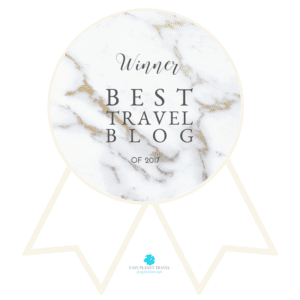 The awe-inspiring view was still composed by a bright blue sky, clouds and the Urubamba River snaking around colossal mountains covered with lush vegetation. What a gift from our mother nature! All the sacrifice paid off and I felt boastful for not giving up. Finally I sat down on a bench at a small round hut at the summit to have breakfast and rest. I took some pictures and videos, and got ready to hike down. The summit of Machu Picchu Mountain. The Urubamaba river flowing on the valley. When I was about to go down, my legs started cramping. To make sure what was happening I stopped and my legs started trembling. I was so worried if my legs got “frozen” and I couldn’t walk down. I still needed to go all the way down to Machu Picchu, then Aguas Calientes, then two more hours walking on the train tracks to Hidroélectrica. I saw myself in a pitfall, running out of water, time and money (my wallet was stolen the day before) and my legs were hurting. Thank God I found kind people who gave me some water and even a banana. I don’t know how I finished the hike in two hours (1:15 up and 45min down) and arrived in Hidroélectrica right on time to take the van. 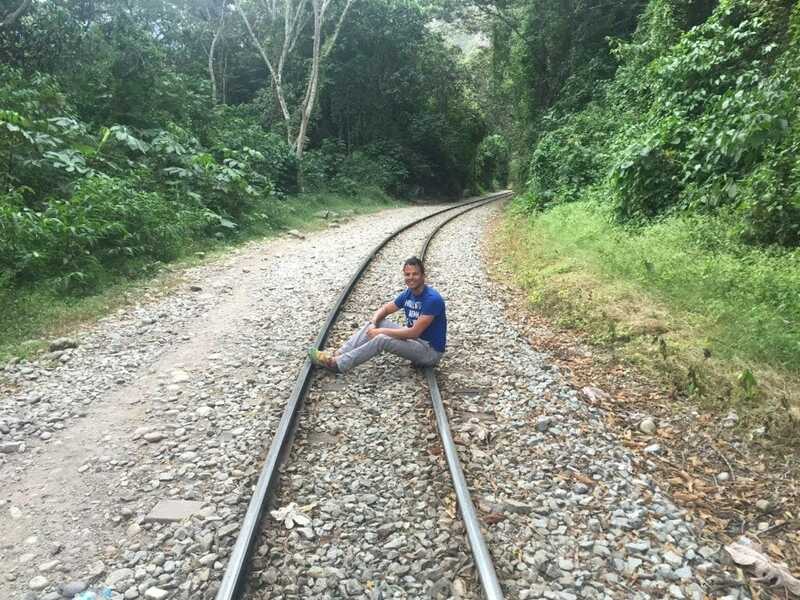 On the train tracks from Hidroeléctrica to Machu Picchu Pueblo the day before. Planning my trip to Peru I couldn’t imagine that all those things would happen. Yet Machu Picchu is a must-visit landmark and the Machu Picchu Mountain hike is a once-in-a-lifetime experience! Check Machu Picchu Mountain’s location on the map here. By train: the most common and fastest way. 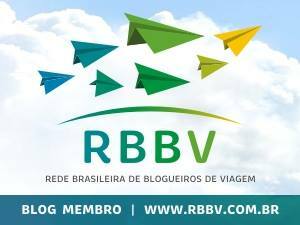 It takes around three and half hours and the cheapest ticket costs around US$ 160 round trip. By van or minibus: it is much cheaper than the train but longer. It costs 40 soles (US$13) each way, and takes around 6h. But you have to walk at least 2 hours more on the train tracks. Some of the companies that fly to Cusco are: Avianca, Latam, Peruvian Airlines and Star Peru. The period to visit Machu Picchu is very important because it’s located up on the mountains covered with tropical forest of the upper Amazon. 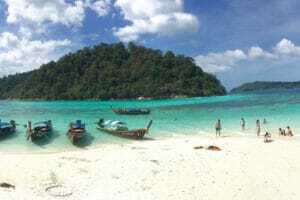 From May to September is the dry season and from November to March the rainy one. Considering that July and August are the busiest period, the best time to visit Machu Picchu is the shoulder season (from May/June and September/October). 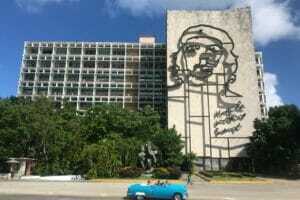 I stayed at Hatun Wasi Hostel. * Van from Aguas Calientes to Hidroeléctrica: 70 soles (US$ 21). The hike is at your own, so be careful because you can sprain your ankle on the steps easily. Bring water, sun screen, and food. Wear appropriate clothes and shoes for hiking. Thanks for sharing! You are quite the adventurer! 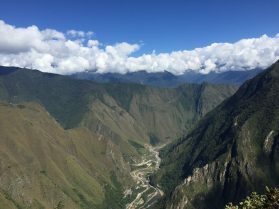 Pingback: How to Buy Machu Picchu Tickets as an Independent Traveler to Peru? What a good experience you lived in. I am also blessed for having been in, I booked my machu picchu tour with Inka Challenge Peru and their services provided to me were fantastic. 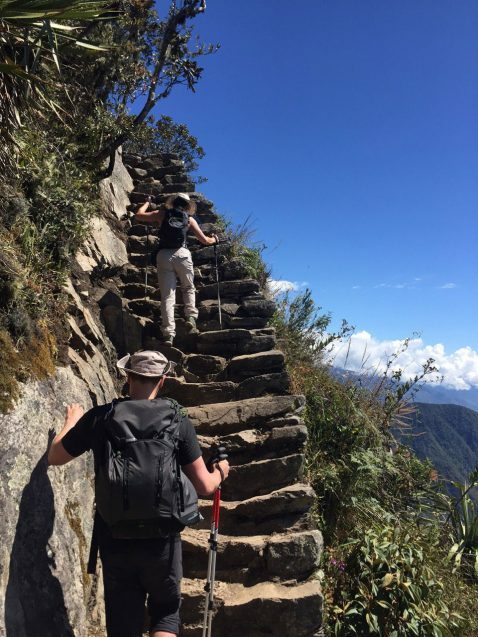 What did you think of the Machu Picchu Mountain hike? Great view of the mountains behind Machu Picchu! Looks like you got there and it was a really nice day. 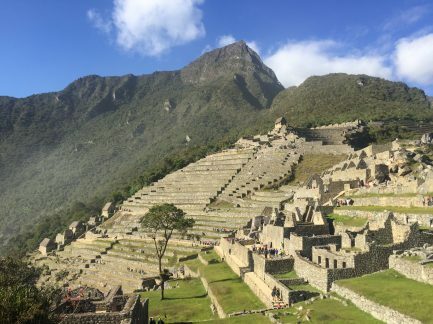 How did you get to Machu Picchu? Train or one of the treks? I think it’s a really nice hike that provides a fantastic view. The day was beautiful, but I didn’t have too much time though. hello i am wondering if i can visit tge citadel ruins and also do the mountain hike… does it give me enough time?? Yes, it does. It was exactly what I did. I just had to rush because I had to take the van back to Cusco at the same day. Otherwise I could’ve stayed at the citadel longer. I updated the post because there are some new rules implemented this year. 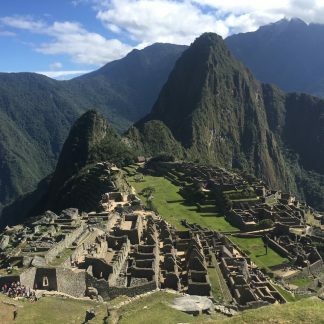 Since January of 2019 visitors must have to choose the time slot they want to start visiting Machu Picchu. The first is at 6:00 AM and the last entrance is at 2:00 PM. 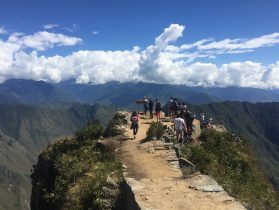 The visit now is limited to only 4 hours but for those who are hiking Machu Picchu Montaña the limit is 8h (5h for the hike and 3 for the citadel). If you still have any doubt let me know. What a journey! Loved reading about your hike – impressive that you made it in such a short time! I’m planning a trip to Peru in the summer and have a few questions. Thought you might be able to help! I am curious how entry into Machu Picchu works – is a ticket’s entrance time specific to the citadel or to the mountain hike? Also, did you have a guide for your time in the Machu Picchu citadel? I’ve seen different things and can’t figure out if a guide is required, or if it’s possible to explore Machu Picchu independently with just an entrance ticket. Thank you so much for your comment! I’m sorry if I wasn’t that the clear but your question made me find a really good information though. 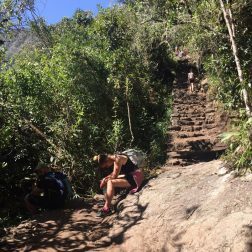 To hike Machu Picchu Mountain you can do it only in two different time slots, as I mention in the post: you can start anytime from 7:00 to 8:00 or from 9:00 to 10:00. So, in order to visit both you need to buy your ticket to enter Machu Picchu at 6 or 7 to start the hike between 7 to 8, or enter at 8 to start the hike between 9 to 10. I hope it’s all clear now. Cheers and have fun in Machu Picchu. Thank you for the post, I thought of giving up on the hike there – but you have showed me that is so wonderful… now I am confused what to do. 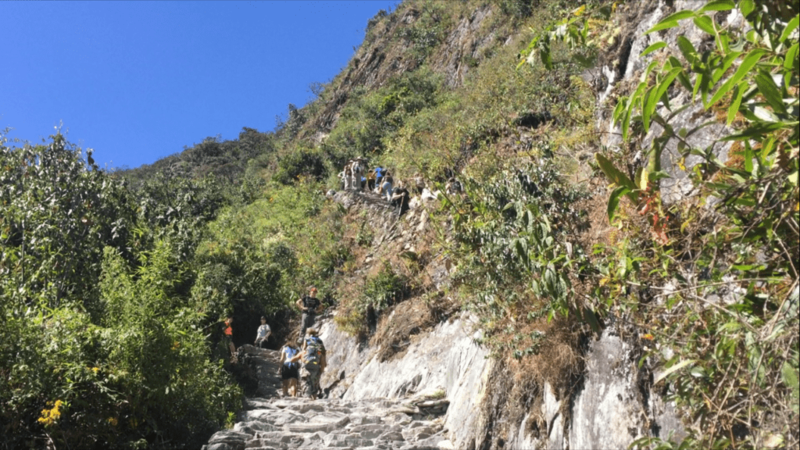 😀 I am overall fitt, but I tend to have fear on narrow steeps and so on if there is no wall or some ‘nature’ next to me, and after watching a video about Huayna Picchu, I thought no way – unfortunately I can’t do it as it seems very scary for me. I believe you can do it. I’ve seen a video of Huayna Picchu and I was also terrified. Machu Picchu Montaña isn’t like that. Yes, there are some kind o protection (trees or walls) basically the entire trail. What I did while hiking was I wasn’t looking up but just straight and right to the next step that I was climbing. I didn’t want to see how tall the whole thing was… It helped me a lot!